SkyUp airline has expanded its fleet with third Boeing 737-800 NG plane with 189 seats made in 2013, which became the fourth plane in the airline’s fleet. 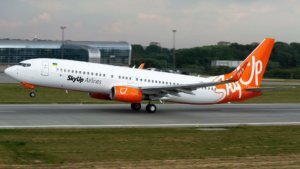 “On the evening of November 28, the fourth plane of SkyUp Airlines, a Ukrainian low cost airline, Boeing 737-800, landed at the Kyiv airport,” Sikorsky Kyiv International Airport said on its Facebook page on Thursday. In addition to the Boeing 737-800 NG, SkyUp has one Boeing 737-700 NG with 149 seats, and by the end of December, the airline is waiting for one more aircraft of each these two modifications. SkyUp Airline LLC was registered in Kyiv in June 2016. The founder of SkyUp was ACS-Ukraine LLC belonging to Tetiana Alba and Yuriy Alba, who also own JoinUp! tour operator. The company began charter flights from the end of May 2018. In October 2018, SkyUp airline received a Third Country Operator (TCO) License, allowing flying to 28 countries of the European Union (EU), as well as Switzerland, Norway, Iceland and Lichtenstein. In December, the airline plans to launch regular flights.